Bees get hot in the summer. Especially when they live on a tar roof without shade. 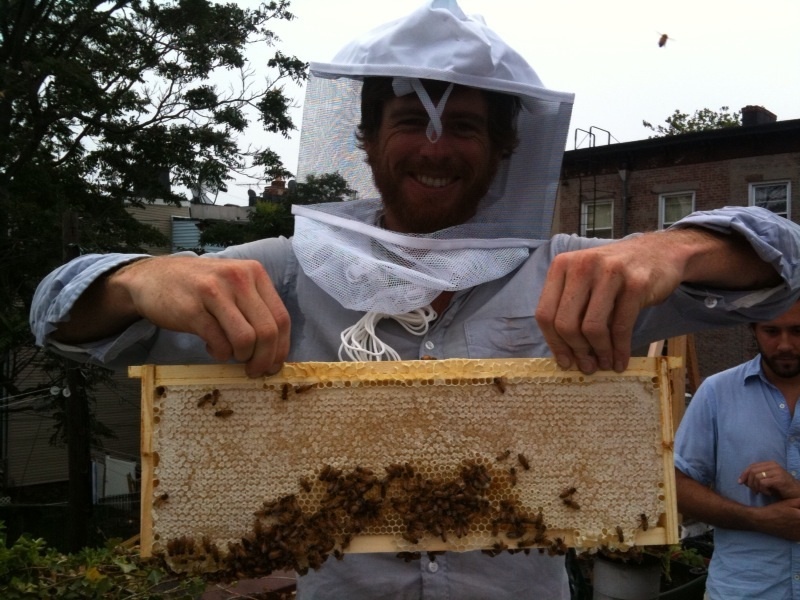 Without the standard Fedder air conditioning units most other Brooklyners enjoy, my bees must rely on alternative cooling methods. Sunday, as temperatures reached the mid-90s, I went by for a visit and was astonished to see them covering the face of their hives. It’s called bearding, and it’s a tried-and-true method of cooling off. It’s crowded in the hive, and a bee beard alleviates the crowd a little and gives everybody more space. I had never seen this before, and I was nervous that the bees might be preparing to swarm. I had very little battery left on my phone to call my Mom. 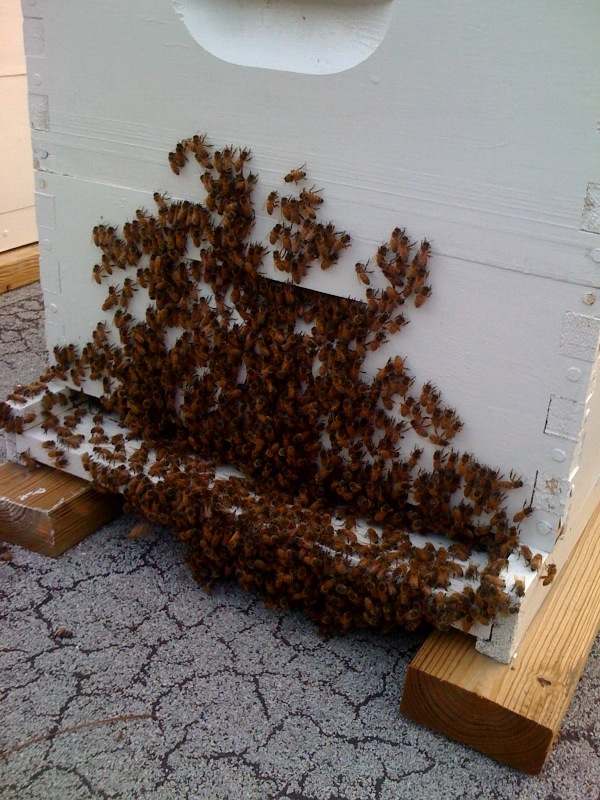 I texted Megan Paska a photo and she advised that it was probably ok, as it is unusual for a first-year hive to swarm. I knew the bees still had some space to grow into because I had checked five days before. I decided to do an impromptu inspection anyway to be sure. In the five days since I last checked this hive, its top medium have gone from about 20% drawn out with comb to nearly 100%. That was fast, faster than they had drawn out anything else to date. I think this confirms we are in heavy nectar flow season now. 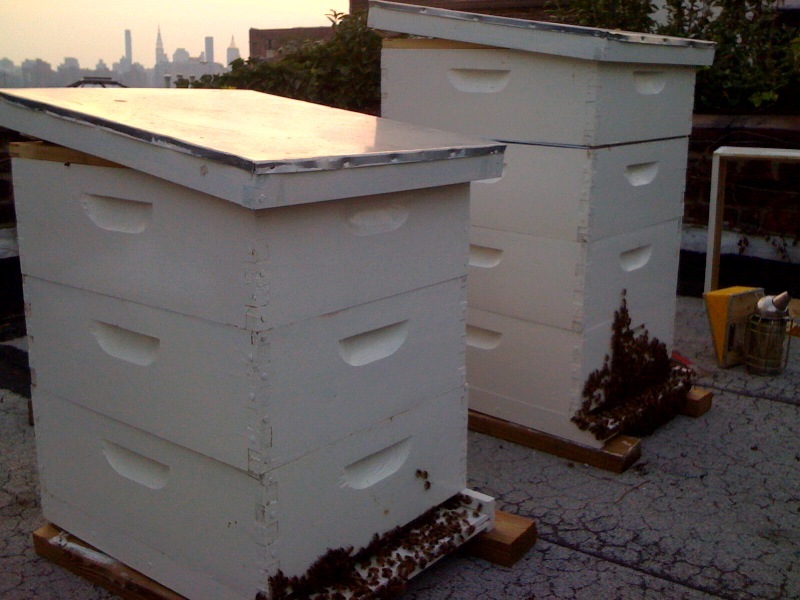 The hives are about two months old, and because the nectar is really flowing, the frames are heavy with nectar and capped honey as well as brood. A 10-frame medium weighs 60 lbs when full, and my bees have filled nearly 3 of them in each hive! I don’t think the bees were preparing to swarm, but I’m glad I checked, because it was time to add my first honey super, which is what I will soon harvest honey from. Bees have other methods of keeping the hive cool when it’s hot. There are house bees who mind the temperature, sort of like the house elves at Hogwarts who tend the fires. Mom says the house bees fan their wings in a way that takes the humidity out of the hive. This cools the hive, and it evaporates moisture in the nectar as it changes to honey. There’s differing opinions about things a beekeeper can do to help a hive keep cool. 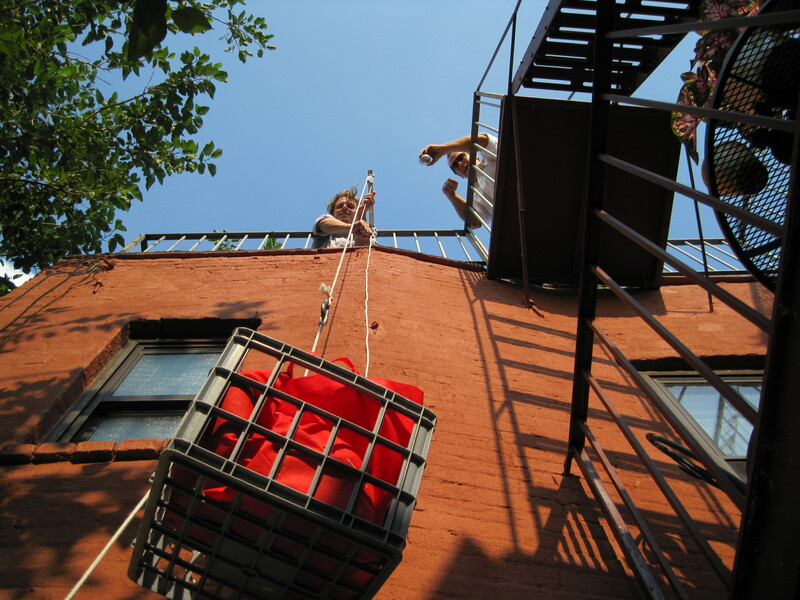 There are adjustments you can make to the hive to encourage the humid, hot air to exit from the top, drawing fresh air in the bottom. I’m considering getting a bottom board with a screen to help with ventilation. I propped up the outer cover with oyster shells in the meantime, but I’m not sure if my messing with their ventilation system is productive or counterproductive.